Most Gamers use game console or computer to play many games. For PC game users, 3D games’ video and audio effects are very important. First of all, for better visual effects, the users need good VGA and large LCD monitor. For the audio, I suggest hi-end audio chips and Gaming speakers for better audio. If you use computer long time every day, I think LCD, Keyboard and Speaker are worth to invest. Many people use their monitor, keyboard and speaker for 5~10 years. 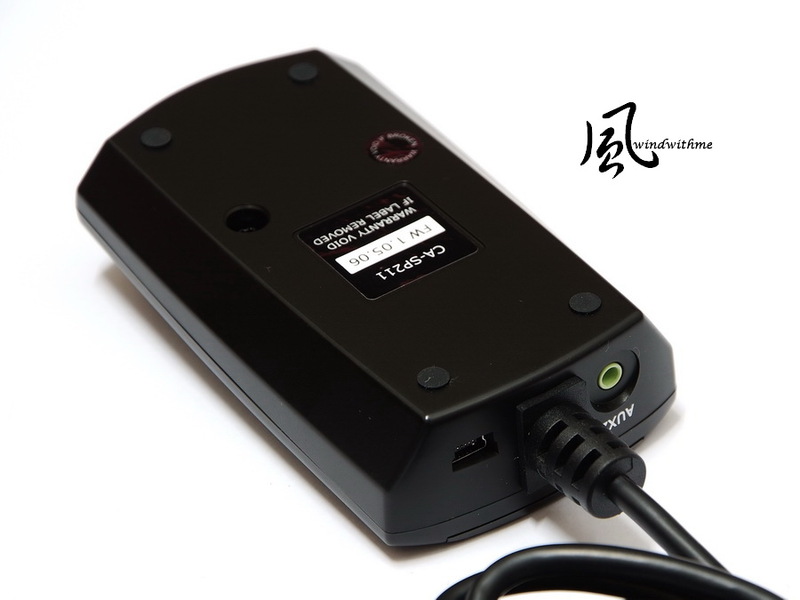 Investing better quality peripherals can let you feel more comfortable and longer life. 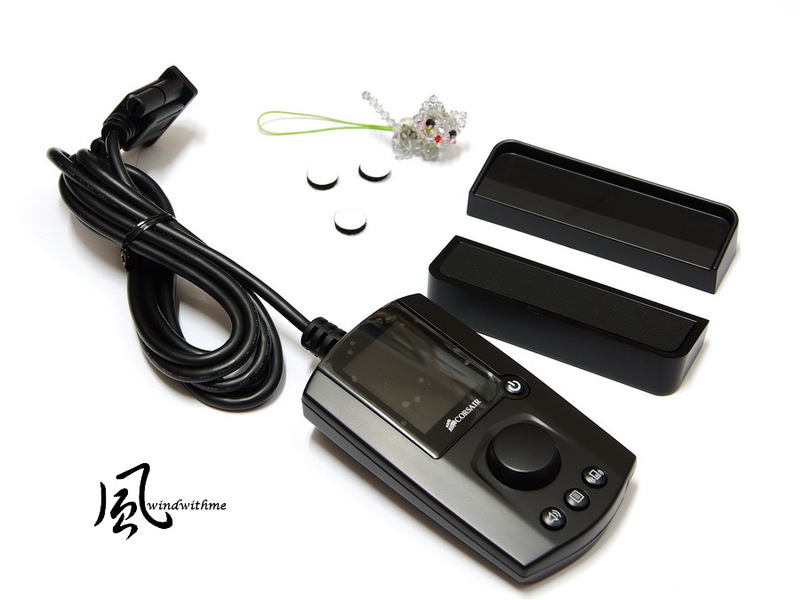 These peripherals contact your sense directly. Better equipment can avoid your uncomfortable feeling. USA CORSAIR recently launched several audio devices. You can find the headset and speaker product line in their website. This review is Gaming Audio Series. 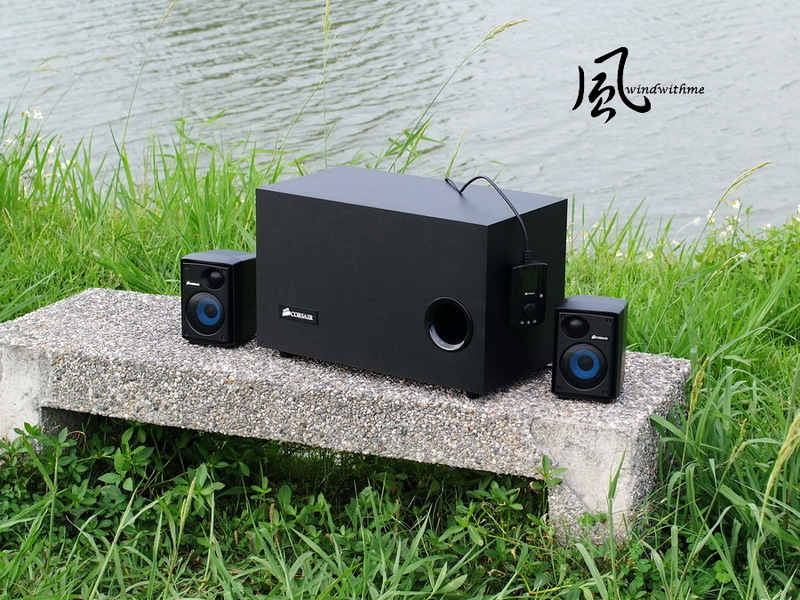 The model is SP2500 High-power 2.1 PC Speaker System. You can clear understand it focus on gaming market. It should be a good option for gamers. SP2500 is official 2 years warranty. As the box is bigger, the space and protection are quite good. 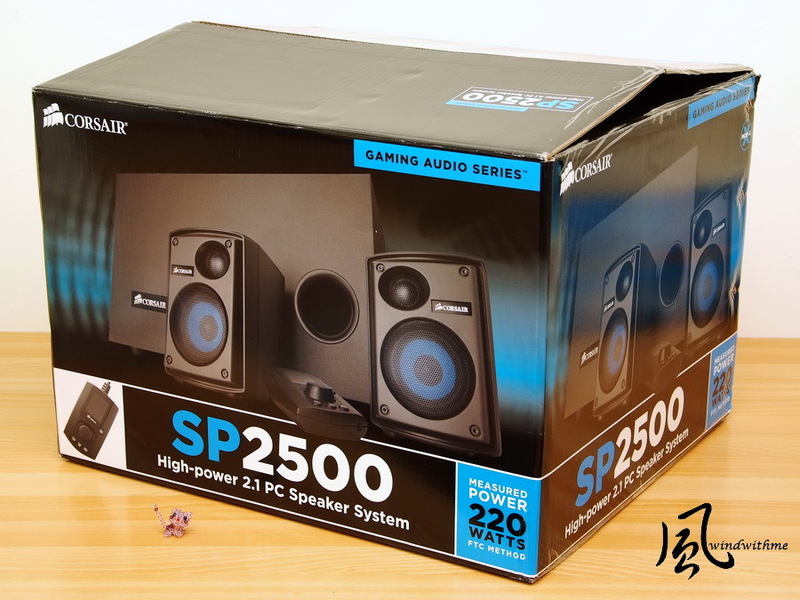 SP2500 is 2.1 channel PC speaker system. 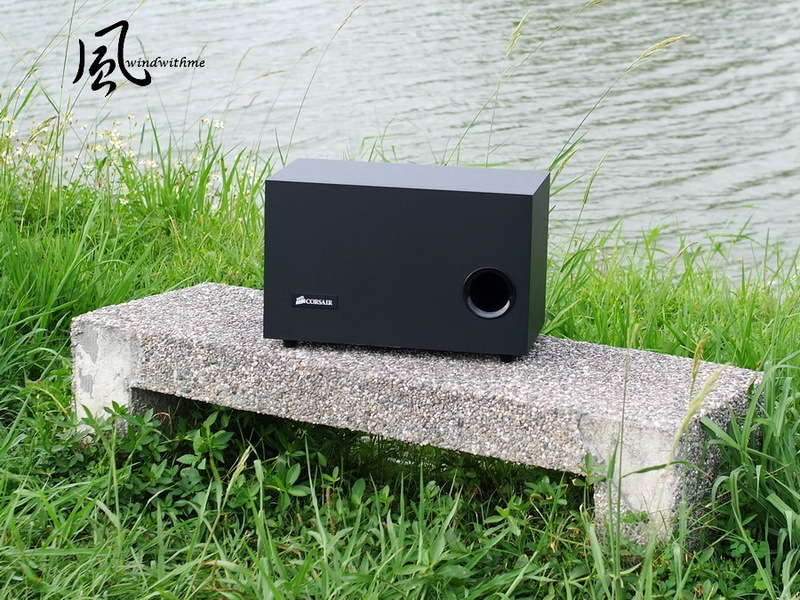 The pic below is Subwoofer. 8 inches 120W. It bridged dual 60 Watt class-D amplifiers with integrated DSP for 120 Watts of power. Fourth-order closed bandpass design with durable rubber surround. The dimensions are 46 x 25.8 x 29.7 cm. 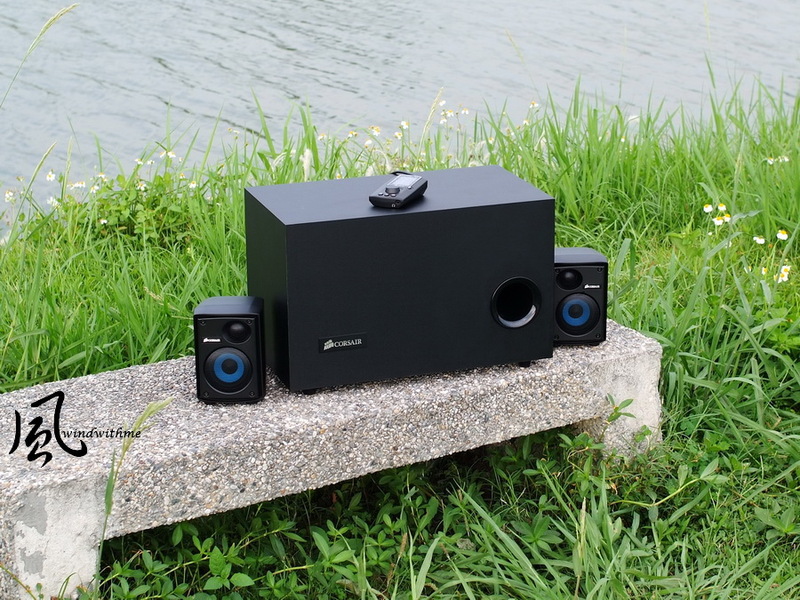 It’s quite big size which we consider to computer speaker. The manual has notice that user should allow 25cm clearance from Subwoofer to object. SP2500 is one Subwoofer and 2 satellites. It also has 1.8” LCD wired desk controller. 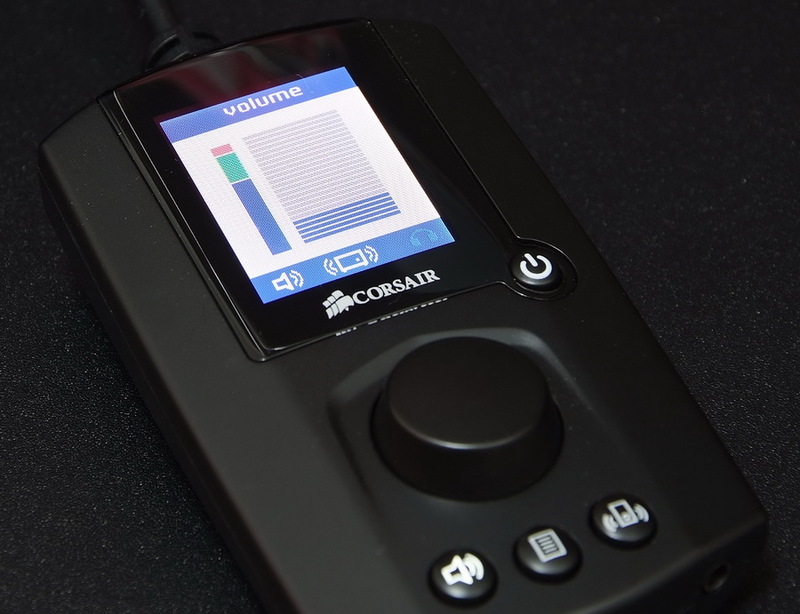 Users can adjust the volume easily. The desktop controller has 2 jacks. One is 3.5mm auxiliary inputs and the other is mini USB. Lower-Right is a 3.5mm headset output. The dimensions are 10.8 x 12 x 15.9 cm. The actual weight is 924g. The case is made from good quality plastic. Front bottom with block up part, the sound can surround the room more widely. The satellite speaker has round cushion in 4 bottom corners. Central blue circle is 3” and official spec is 40W. Upper left circle is 1” and official spec is 16W..
56 watts per satellite, so the continuous power is 112W . 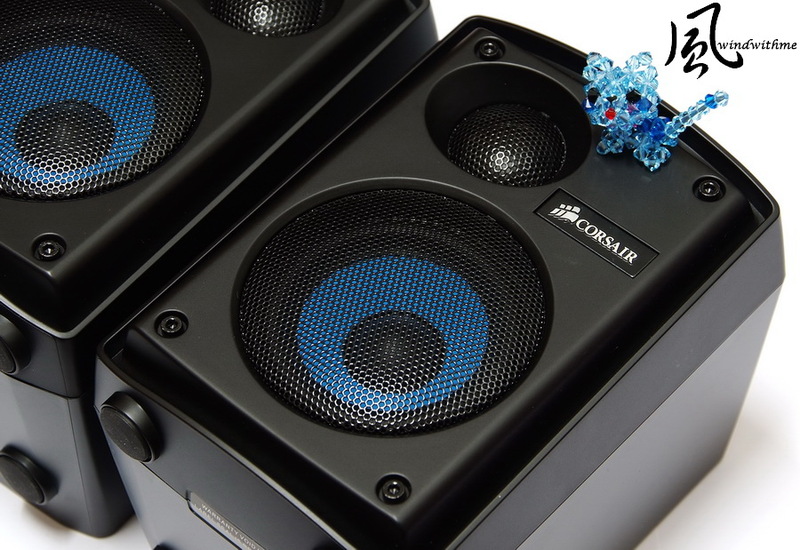 Total output of the speaker system includes subwoofer is 232W RMS which is bridged 6 Class-D amplifiers. Upper Left “Remote” is for desktop controller. Upper Right red/white ATX4 jack is for satellite speakers. 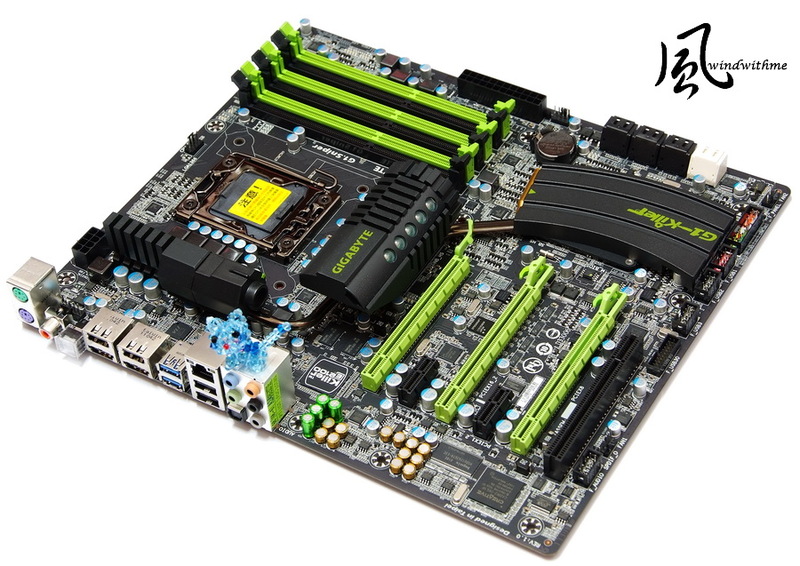 ATX4 is a really good design that can avoid oxidation after long time use. Lower Left green AUX1 jack is for audio card 3.5mm connector. 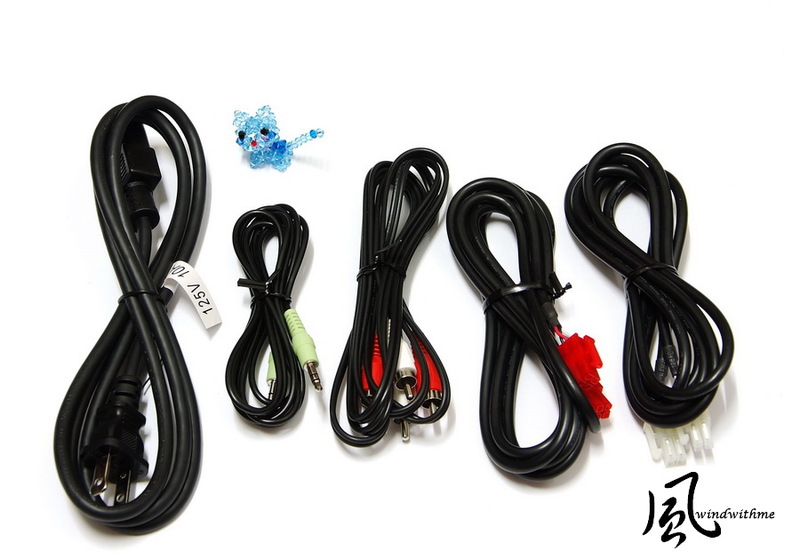 Lower Right red/white RCA jack is for high end stereo devices to connect. They list the certificate and caution list. I separate 2 parts to test the audio quality. One is using MB built-in audio chip. 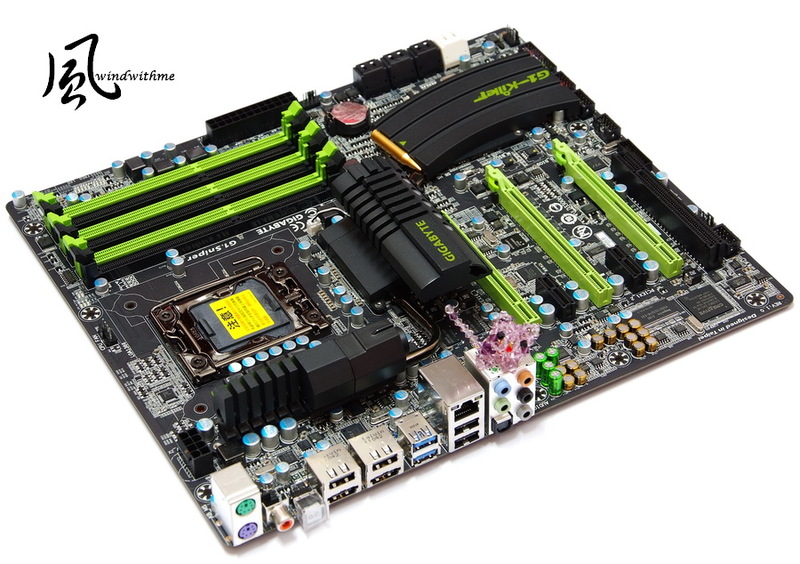 Currently, the most top built-in audio is GIGABYTE G1.SNIPER. Furthermore, G1.SNIPER and SP2500 are positioning for Gaming market. This combo can make audio quality be better. G1.SNIPER changes their audio and network chips comparing to past high end boards. It also supports multi-VGA technology. The users can have more expandibility. GIGABYTE G1.SNIPER built-in Creative Sound Blaster X-Fi audio processor, model is 20K2. Built-in 128MB Memory cache for 20K2. 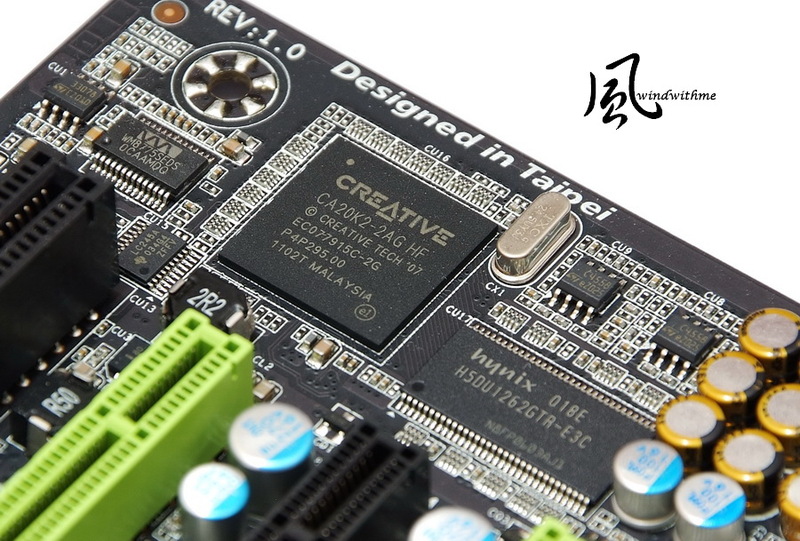 This design is for Creative high-end audio card only before. Yellow and Green Caps are special for audio only. 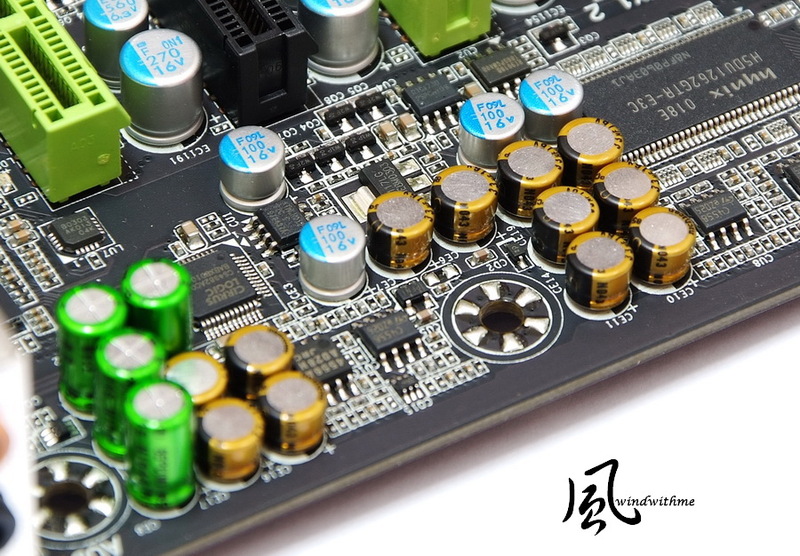 This is the first time I saw such high end audio chip, capacitors and cache design in MB. There are some threads in internet to discuss this design as well. Some users think the caps will cause audio be too thin and hard. 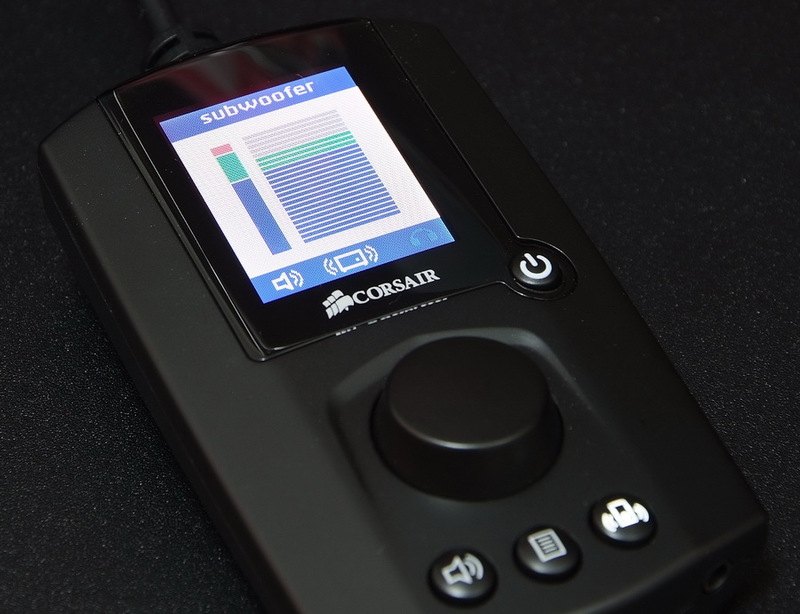 I hope G1.SNIPER can consider the hiend components on audio card to enhance their audio quality level. 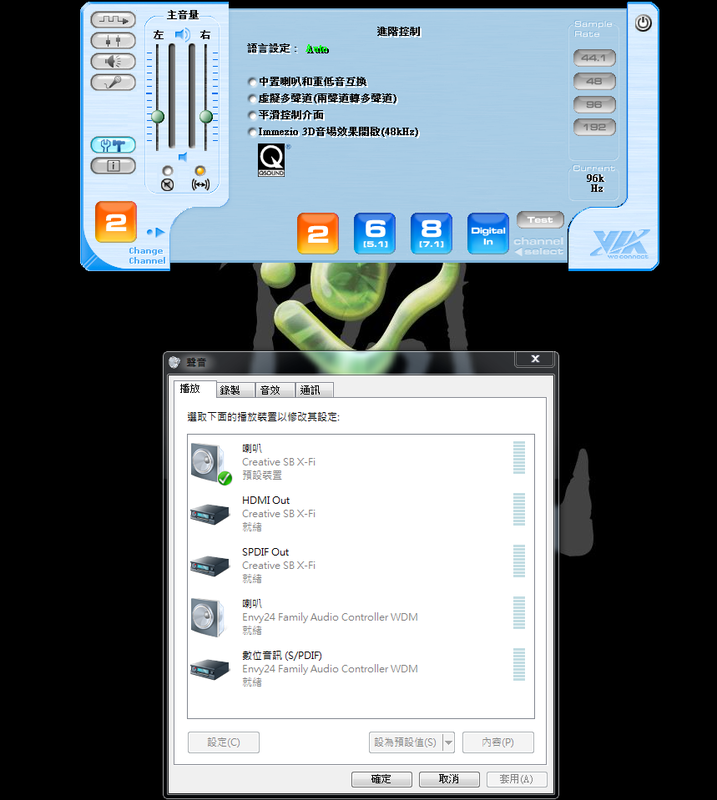 Creative X-FI software provides Entertainment/Game/Audio Creation modes. Entertainment mode provides highest quality for audio and movie playback. I use this mode for movie test after. Game mode panel optimizes the game soundstage. Audio Creation mode. I don’t test mix or recorder this time, so I won’t use this mode. High frequency tone is very good. You won’t hear grating sound. Mid frequency is mid-high level. You can discern human voice clarity clearly. I think the weak point is the rich sense of mid frequency. X-FI chip needs to improve in the future. Low frequency is the key part of this combo. Accent is not to strong. You can hear the fat and extension. For computer speaker position, this is very high level one. Basically, it’s very average. SP2500 and X-FI build very good soundstage. The sound exquisite and reproduction is mid-high level. This combo is suitable for gaming and movie. Surrounding sense is very strong, especially the character walks on the plank. The “wide open space” sound is very good due to 2 channels mutual act. In the fighting game, the effect is from characters fight and the background music. Accent and surrounding soundstage make you feel being on spot. This platform is also rare top end LAG 1366 system. 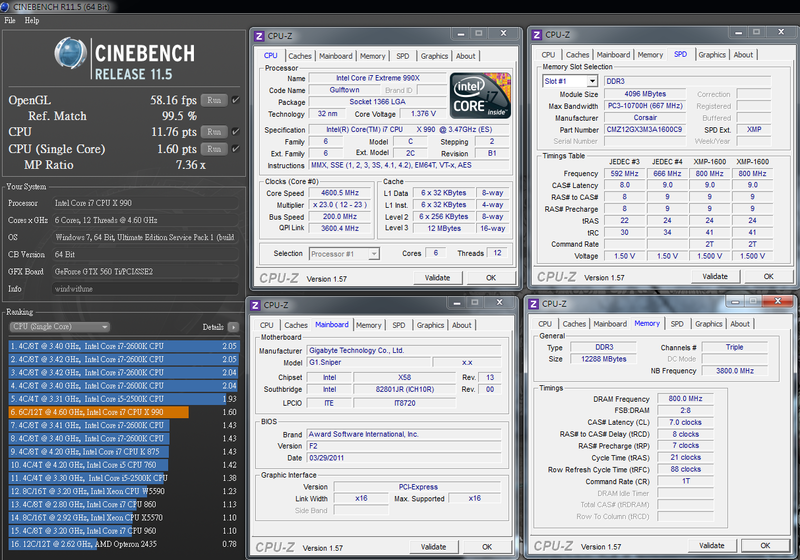 CPU is Core i7-990X Extreme which is just launched 2 months. I also would like to share you some air cooling OC performance. 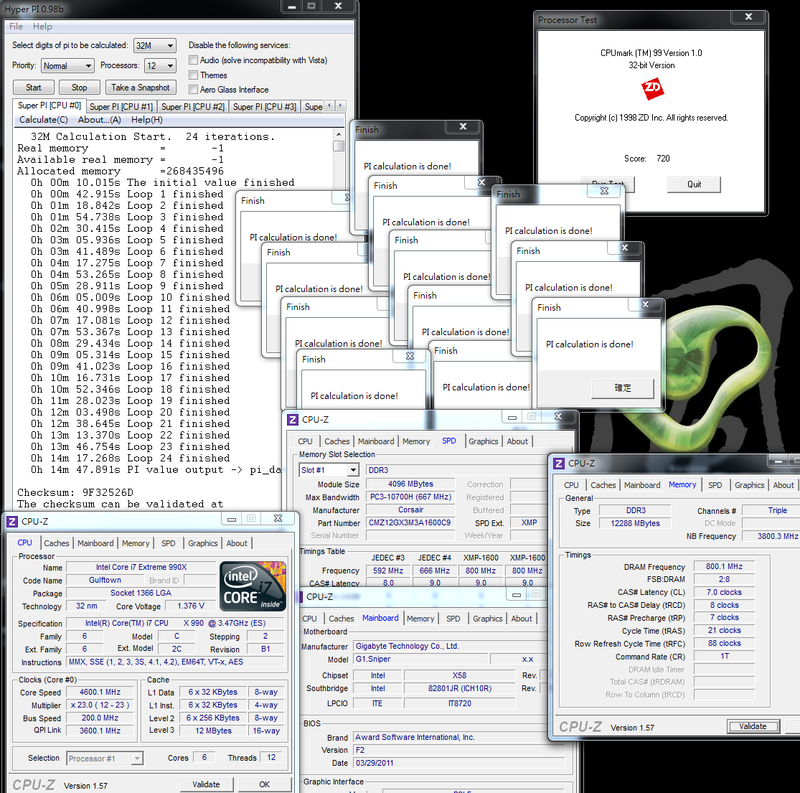 Intel 990X review is not many in internet, I just share some OC performance with G1.SNIPE. 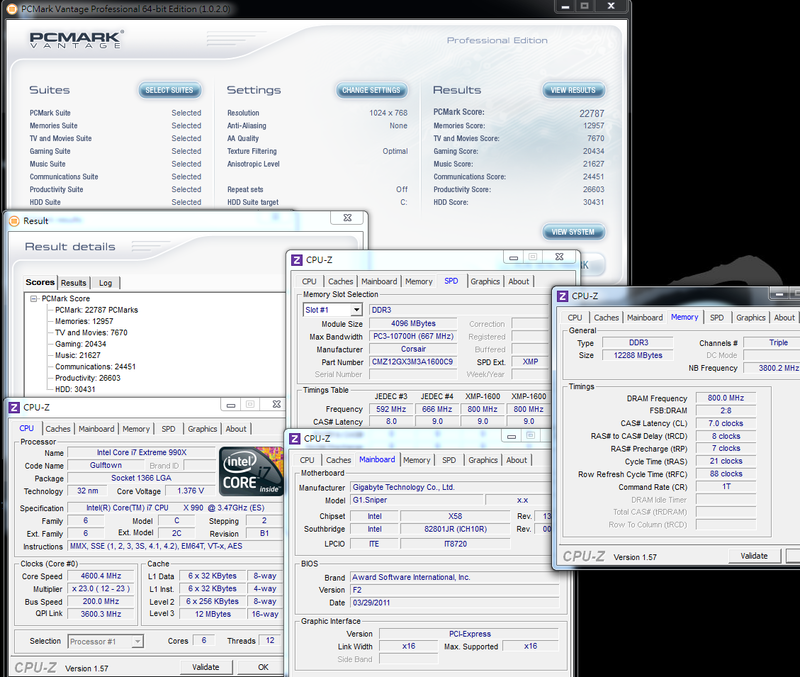 Some benchmark software seems don’t support 6C12T. So some CPU test performance is only a little bit higher than 4C8T structure. 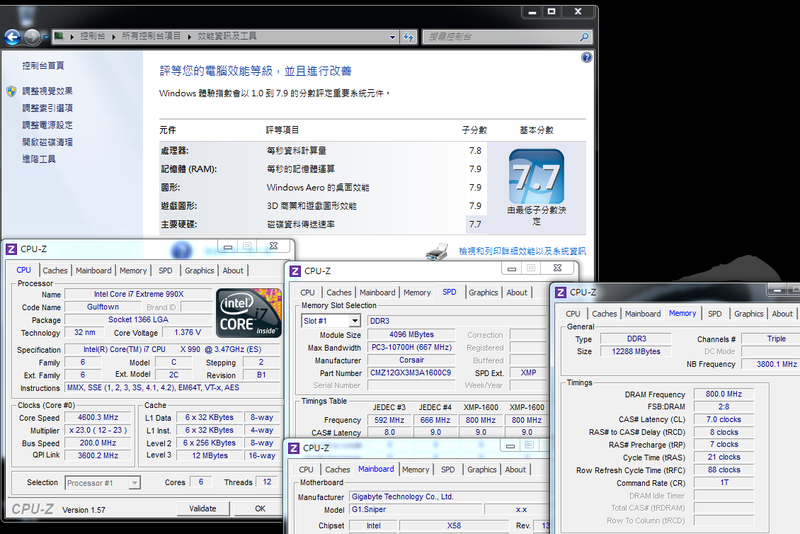 In full support 6C12T software, 990X can have wider CPU performance improvement. Back to audio again, next is desktop controller and 4 setup pages. Volume, normally over 5 levels is very loud. Subwoofer, I recommend to adjust to second level, the green zone, to have better low frequency. However, low frequency is depending personal like, you can adjust by yourself. User can fine tune program/eq items to pick the most suitable soundstage effect. It provides 9 languages for choice. It includes Chinese(Simple) and Japanese, etc. The backlight background screen displays the time, dividing into 5/10/30/60 seconds. The colors can choose Day and Night. The LCD color will change to the suitable one. The desktop controller has very rich items. You can optimize your soundstage in many options. It also provides 9 languages to choose and the background can display “seconds” and also can choose Day or Night mode. SP2500 desktop controller is very exquisite. It’s hard to see in normal PC speakers. 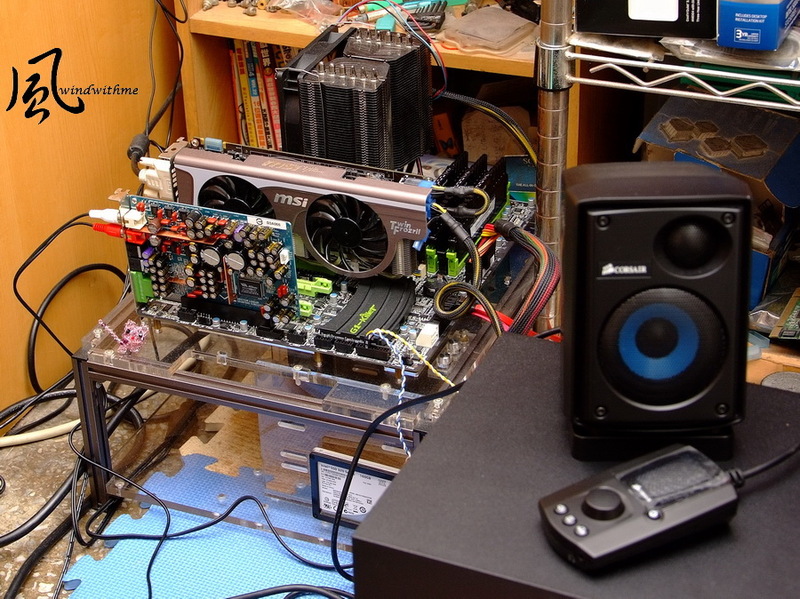 In order to make CORSAIR SP2500 sound be more clear, I use ONKYO SE-200PCI to test. 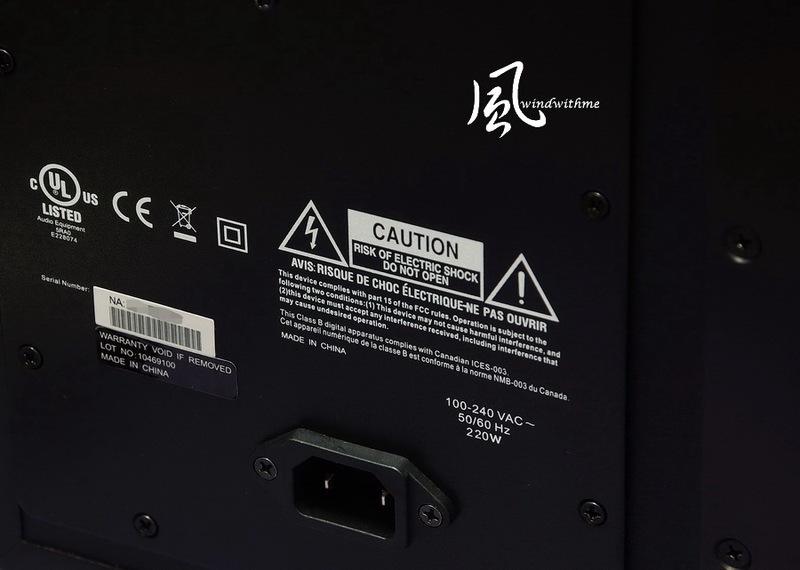 It’s VIA Envy24HT series and the model is VT1724. 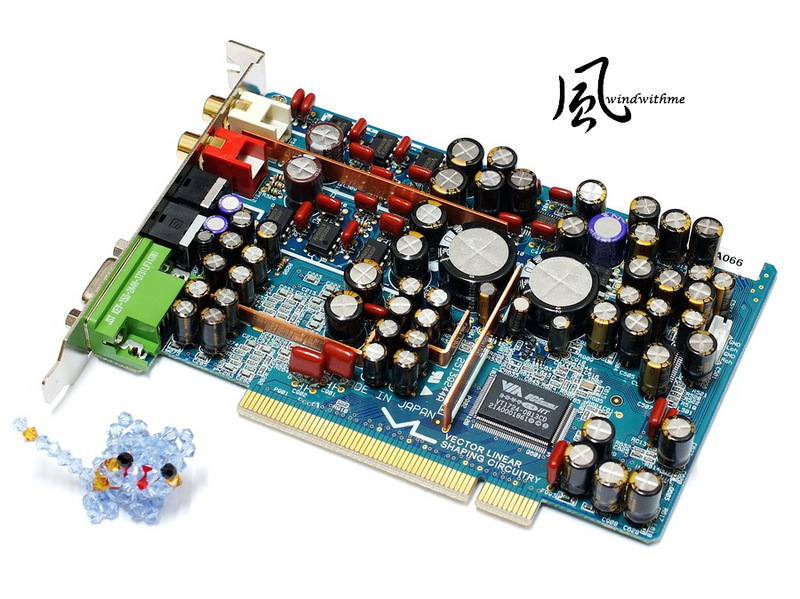 This sound card is very suitable for listening music. The patch is more clean and pure. 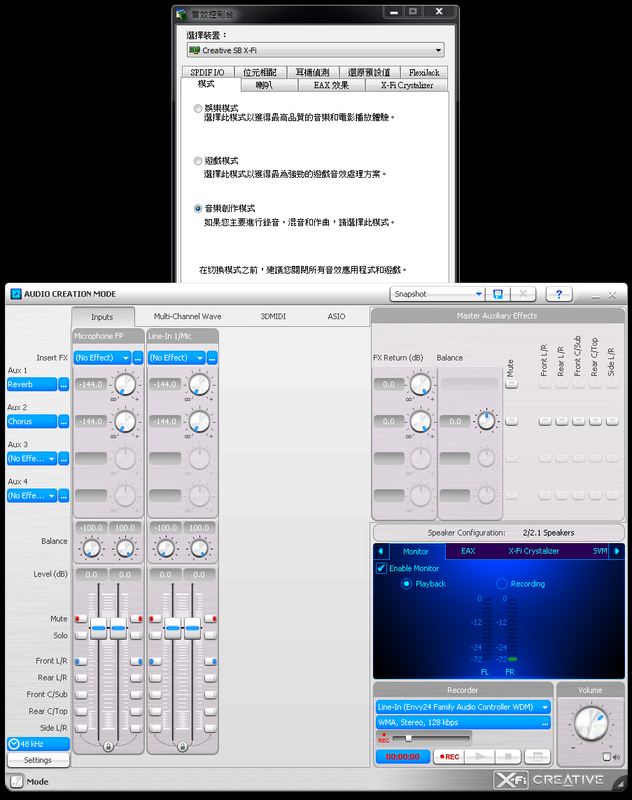 Some audio vendors also use VIA chipset for recorder card. The reputation in internet is very high. 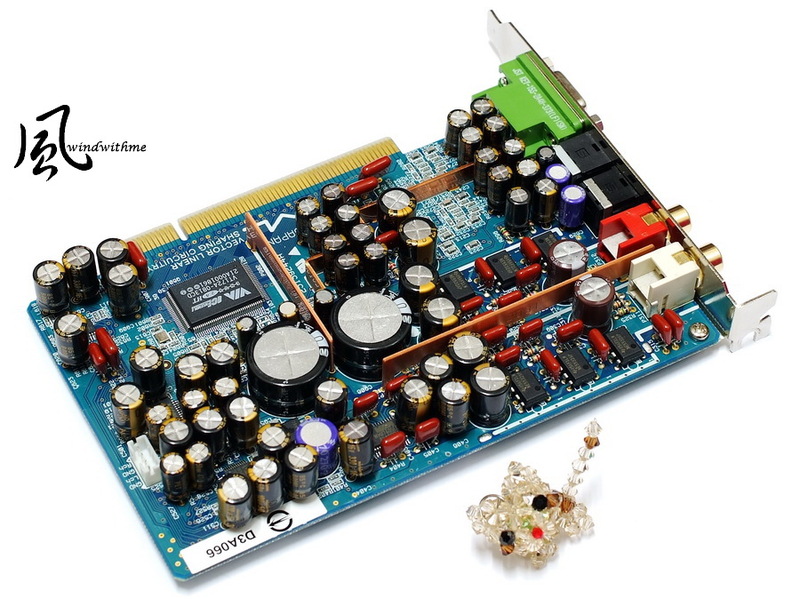 The high caps on card shows ONKYO high intention for the professional audio card. Some internet rumors said next generation SE-300PCI will move to X-FI chipset. I guess it might cater to game or movie hobbyist. 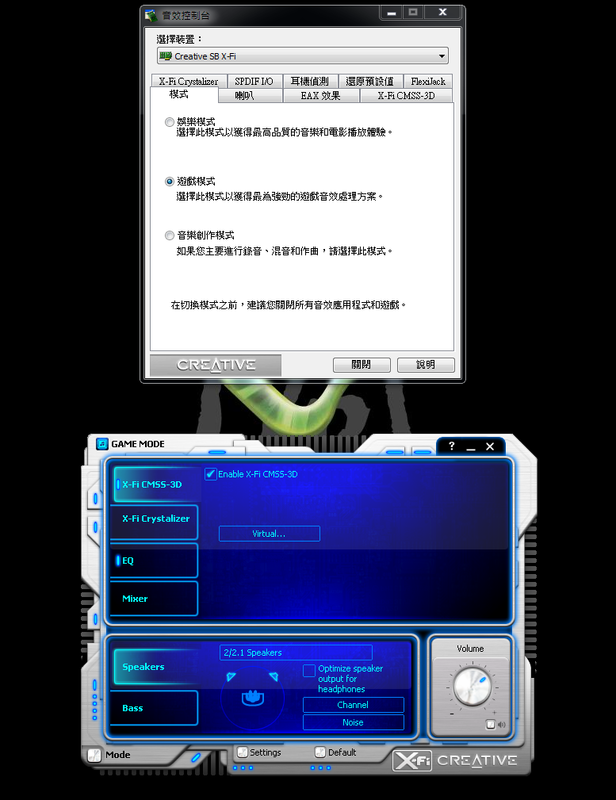 SE-200PCI interface is same as VIA driver software. As my personal experience with several VIA 1723/1724 audio cards, this interface is very familiar. VIA interface is pretty simple. You can use default for all. I think it because Envy24HT is audio quality oriented, it doesn’t have many soundstage setups. High frequency tone is very good. It’s mellower than X-FI, but the difference is small. Middle frequency is very good. You can hear all the human sound detail and the clarity is much better. Low frequency is also mid-high level. Even it’s not such powerful as X-FI, however it’s not far away. Overall, I found the human sound is clear and you can feel the levels as background music or special effects. The accent is not so strong. The sound is a little bit weak, but the stretch is very good. The overall is more balance than X-FI. Comparing to X-FI, you still can hear some detail, but the surround sound is a little weak. The difference is not big gap comparing to music. However, it’s not a big problem. You can adjust the soundstage mode in desktop controller to enhance the accent and surrounding. Using SE-200PCI can leverage SP2500 sound clarity and restoration to another level. It’s more suitable for users who need lossless audio. The mid and high frequency is enhanced very much. For the diversity factor, if you like stronger accent, you can use controller to adjust the soundstage to enhance the low frequency. BTW, X-FI uses analog 3.5mm jack, but SE-200PCI uses digital RCA jack. It may be the reason to cause the difference. For built-in X-FI audio has such good quality, G1.SNIPER use high level audio caps is the key factor. I have been using 5.1 channels speaker for years, because I thought only 5.1 channels speaker has better surrounding stereo. After comparing with few friends’ 2.1 channel one, I found the audio detail and human sound are better than 5.1 channels. 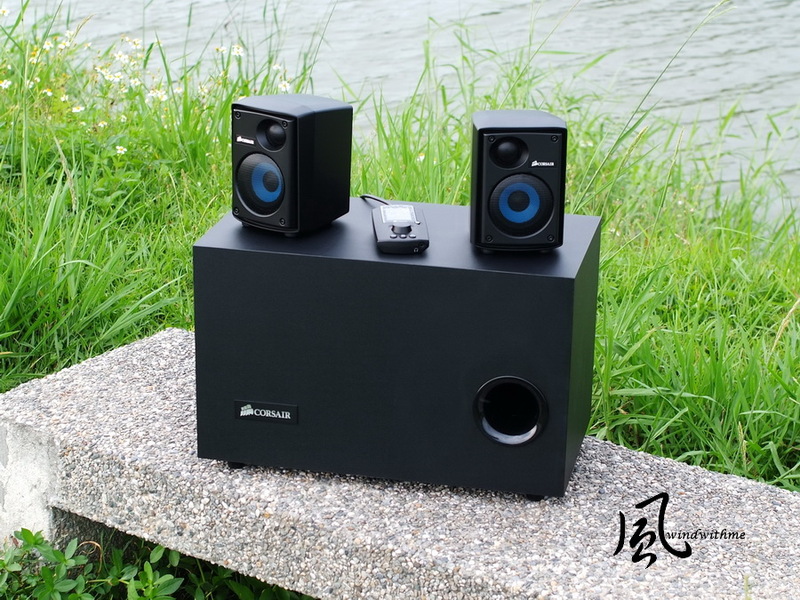 2.1 channels speaker is more suitable for my demand. 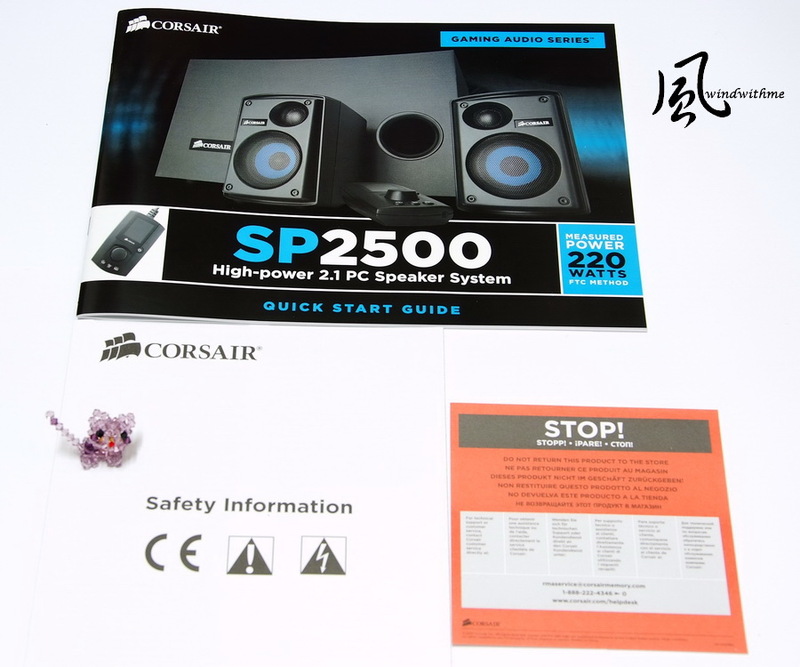 This CORSAIR SP2500 is high end 2.1 Gaming PC speaker. 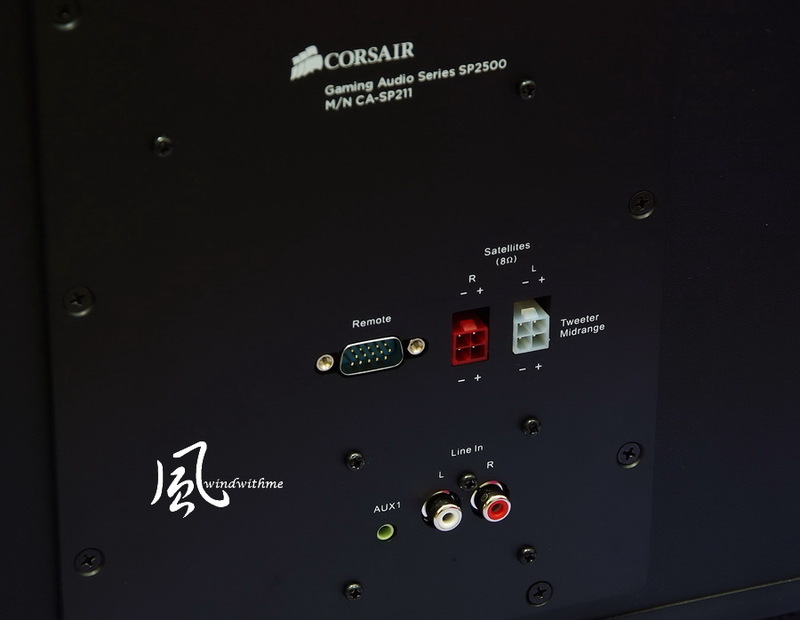 CORSAIR also has mid-end SP2200. SP2200 price is only 40% of SP2500. 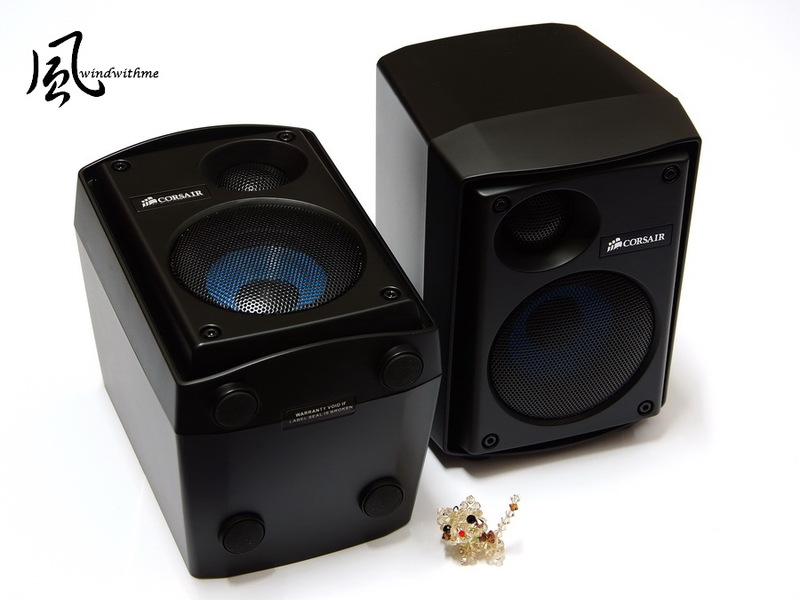 The position is par price PC speaker. The first sight of SP2500, I feel the outlook and quality are good level. The desktop controller is also very fine. Even though it position at Gaming segment, the sound in move is also very good. 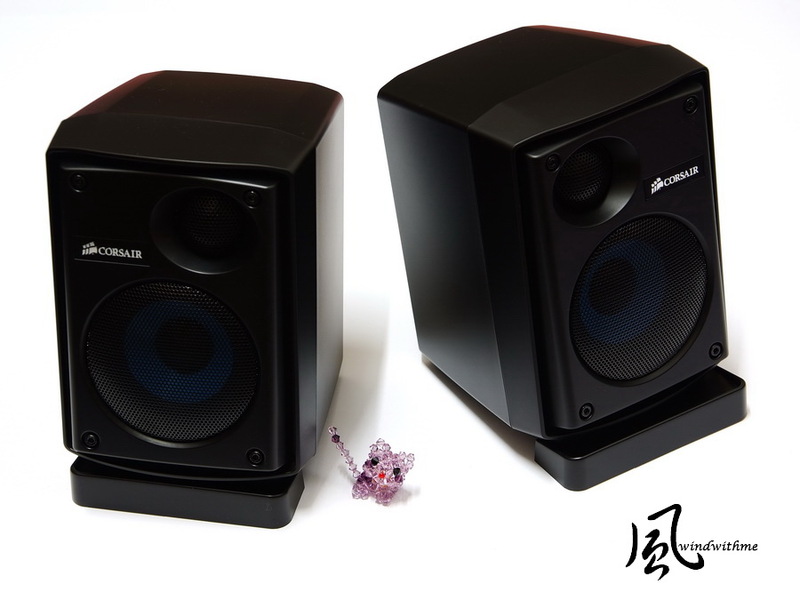 It’s a very competent for multimedia PC speaker. 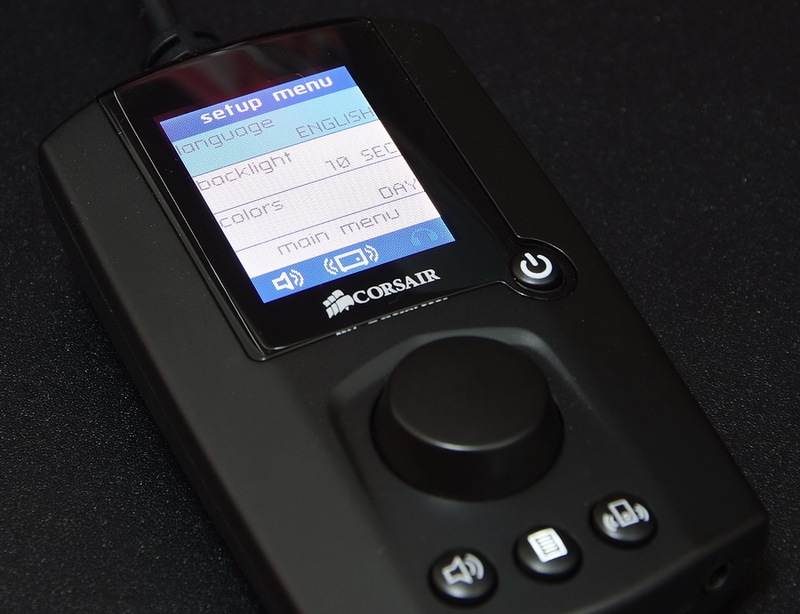 Combining with 2 high end audio chips, the overall performance is very good level. Good gaming speakers need good audio cards to bring it into full play. The audio quality test above is subjective. Everyone has your own feeling for audio. The sense range is PC speaker level. I set up in default values to avoid the environment affect. thanks ,It's meaningful and the picture is so great!